14 albums into his solo career, 19 with other bands/projects and a lot of guest spots under his belts Jorn Lande is a heavy metal phenomenon of his time. If born in the eighties he would have been bathing in dollars… But this is the wrong decade, so sales of more than 2 million albums is an achievement. Alas the quality of his releases seems to be on the vane, at least with the previous outings that has since 2009 only been one studio album, the others being two live albums, one greatest hits and one DIO tribute. Until now! Opener “My Road” is a short half-song, not an intro not a full song – not all that entertaining as it never develops. 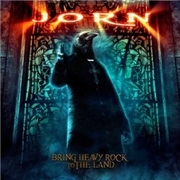 The title track is same old from JORN and the “ok-tag” is very frequent during my listening sessions. The finest moments are the CHRISTOPHER CROSS cover “Ride Like the Wind” (already used by SAXON way back) and the IRON MAIDEN-esque “Ride to the Guns”. A pity that 50% of the merely two really good tracks is a cover… It seems Jorn Lande needs an outside to write for him, but on the other hand he has enjoyed mighty fine sales figures… The overall feeling is, again, that of BLACK SABBATH with DIO on 50% glow. Or the odd effort “Black Morning”, where the band opts for a hair metal power ballad, which feels off the post in this context. Otherwise I dare say that the fans as well as the more seldom listener have all heard this one before.